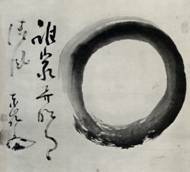 In Zen painting, the Enso is a circle drawn with sumi ink and brush on rice paper. It represents our perfection amidst our incompleteness. An Enso was created with 36 cast bronze Buddhas each 3”x 2”x 2”, set on the floor of a gallery in a 7’ circle. Enso of Buddhas was exhibited at Exit Art Gallery in New York City in 1999, The Choice 99, curators: Janine Antoni, Nan Goldin, Jerry Kearns, Sol LeWitt, Brice Marden, Donald Sultan, and Carrie Mae Weems. Jazz singer, Nora York, while standing in the center of the Enso, performed Amazing Grace during the opening and throughout the exhibition.Enso of Buddhas was also exhibited in the following one person exhibitions:Heart Sweeping, Zen Mountain Monastery, Mt. Tremper, NY, 2002; Searching for the Buddha in the Forest, NY Buddhist Church New York, NY, 2001; Buddhas For a New World, Hillyer Gallery, Smith College, MA, 1998. An Enso of fire, air, earth, and water was created at Forest Hills Park in Boston, MA in July 2003. A circle twenty feet in diameter was made of branches on the earth, lit on fire and extinguished with water. The Enso of fire transformed into an Enso of water/steam and air/smoke. Black charred wood and ashes remain. The Triveni Dance Ensemble, conducted by Neena Gulati with musicians, performed traditional Indian dances in and around the Enso, representing the elements, at each stage of the circle’s transformation. This summer, Enso was created again with a different choreographed performance by the Triveni Dance Ensemble: Shiva’s Cosmic Dance. The dance begins with the fire of destruction as ‘Shiva’ eliminates Evil from the three worlds, and it ends demonstrating nine human emotions – love, compassion, valor, amazement, humor, fear, disgust, anger, and peace. Marigolds were planted in the ashes symbolizing transformation and rebirth. Charred wood and blackened earth conjure up ideas of life, death, and rebirth, as well as the burning away of illusions and desires -a reference to the fierce deities of Tibetan Buddhism that represent cutting through or overcoming our desires. Yet it can also be seen as a reminder of war, destruction of the earth, corruption within ourselves, and the close relationship between purification and destruction. Another Enso was created at the Collinsville Site Responsive Public Art Competition in Collinsville, CT in June 2003. Wood planks from an old factory building on site formed an Enso twenty feet in diameter. Floating in the fore-bay pool in front of the factory, this was set on fire at the opening. The charred wood remains anchored and floating for the summer. Where the halo is a flat and perfectly round disc, still and contained, the enso or Zen circle is multi-directional, flowing, often asymmetrical, unpredictable. It is not a representation, but an unmediated experience of the present moment, which has no beginning, no end, no limitation, and no unchanging form. The flow represents the interconnectedness of all life, and closes the illusory gap between artistic endeavor and spiritual truth, between metaphysical investigation and community engagement. Earth, fire, air, water. 20’ diameter circle. 2004. The Triveni Dance Ensemble, conducted by Neena Gulati with musicians, performed traditional Indian dances in and around theEnso. Flowers are planted in the ashes. Group Exhibition, Revisited. 23 cast bronze Buddhas each 3”x 2”x 2”, set on the floor of a gallery in a 7’ circle 2004. Group exhibition, The Buddha Project, Visual Manifestations of Buddhist Thought in the Western World. 23 cast bronze Budd05/30/2007et on the floor of a gallery in a 7’ circle 2004. Earth, fire, air, water. 20’ diameter circle. 2003. The Triveni Dance Ensemble, conducted by Neena Gulati with musicians, performed traditional Indian dances in and around theEnso. Group Exhibition, Four Elements. Wood, fire, air, water. 20’ diameter circle. 2003. Site Responsive Sculpture Exhibition. 36 cast bronze Buddhas each 3”x 2”x 2”, set on the floor of a gallery in a 7’ circle 1999. Jazz singer, Nora York, while standing in the center of the Enso, performed Amazing Graceduring the opening and throughout the exhibition. The Choice 99. 36 cast bronze Buddhas each 3”x 2”x 2”, set on the floor of a gallery in a 7’ circle 2002. 36 cast bronze Buddhas each 3”x 2”x 2”, set on the floor of a gallery in a 7’ circle 2001. 12 cast bronze Buddhas each 3”x 2”x 2”, in a 24” circle 1998.